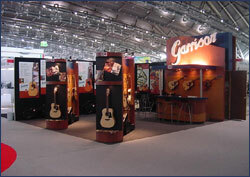 You are looking for an innovative exhibition-performance? By long-standing experience and service oriented cooperation with our costumers we offer you a far diversified spectrum. Never mind if you need 15 or 500 sqm, a system-stand or an individually designed booth - Your company always sets the standard. It is our aim to bring in the philosophy of your products and your enterprise into the booth - to create an excellent environment for your fair appearance.